Stock# - 13770 Tiger Lily Tealight Holder - Just imagine this lovely decoration filled with glowing tealight candles, warming the night with gentle golden light. A timeless designer look that adds instant beauty and drama to your very own home! Iron with glass cups. Candles not included. Stock# - 14121 Sapphire Nights Hanging Lantern - Candle light glimmers through lacy designs, turned into sapphire rays of light. 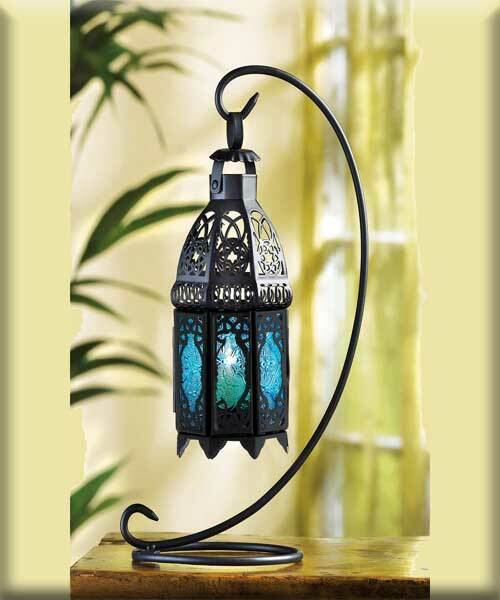 This graceful hanging tabletop lantern enchants your home with the magic of a desert night! Iron and glass. Tealight candle not included. 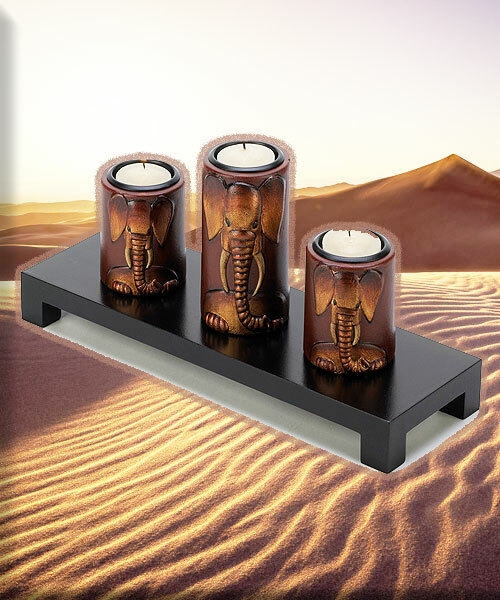 Stock# - 14654 Elephant Trio Candleholders - The light from three tealights will dance off the 3D carvings of these candleholders to make the elephant family come to life as they perch atop their wooden platform. Candles not included. MDF wood and metal top. Set: 11 3/4" x 3 7/8" x 4 5/8" high; tall candleholder: 2 1/4" diameter x 3 1/2" high; short candleholder: 2 1/4" diameter x 2 3/8" high; tray: 11 3/4" x 3 7/8" x 1" high. Stock# - 14587 Elephant Candleholder Set - This darling elephant with an inlaid silver pattern is using similarly adorned torches to light her way across the rocky tundra. This chocolate colored tealight holder set is sure to enhance your contemporary lighting decor. Candles not included. MDF wood, metal and pebble rocks. 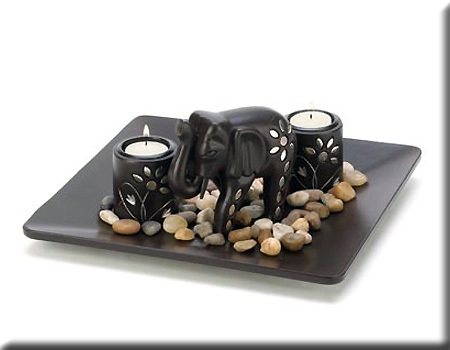 Set: 10 7/8" square x 4 3/8" high; elephant: 5 1/4" x 2" x 4" high; each candleholder: 2 1/8" diameter x 2 3/8" high; plate: 10 7/8" square x 3/4" high. 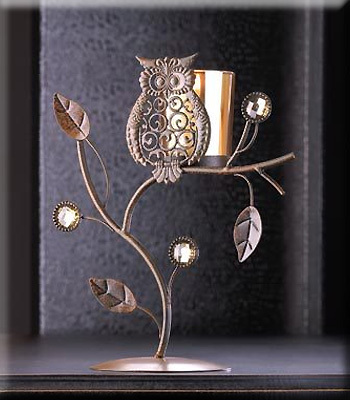 Stock# - 14604 Wise Owl Votive Stand - With its fanciful theme and its rich, earthy colors, this vine shaped candle stand is a wise decorating choice indeed! Cute owl ornament is ever so enchanting when backlit by a candle s glow. Iron, glass and acrylic. Candle not included. 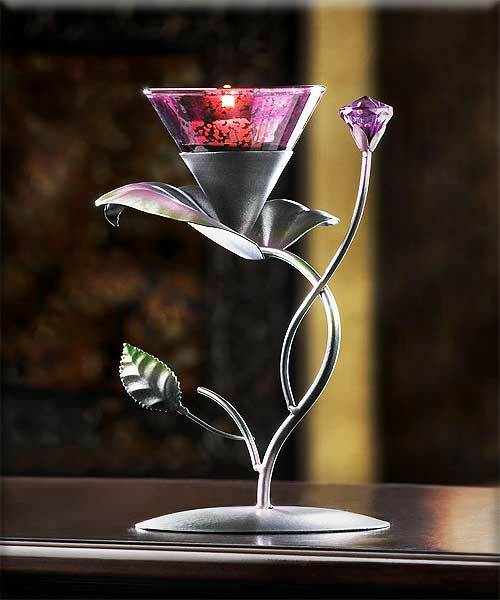 Stock# - D1118 Lilac Lily Pad Tealight Holder - Soothing shades of dusky lilac give this botanical tealight stand a gentle splendor. 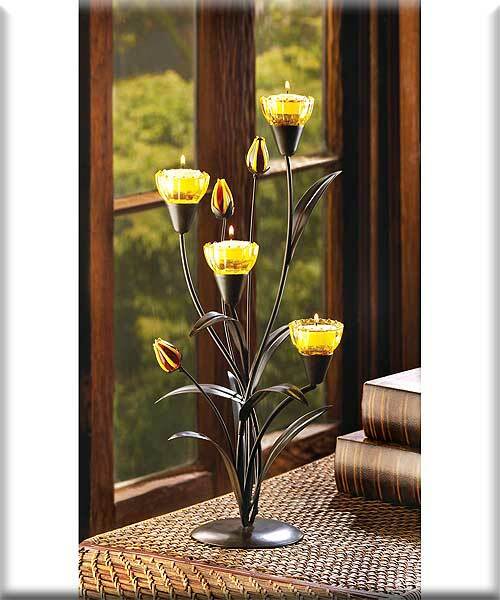 A dazzling backdrop for a candle s dancing flame, adding subtle romance to any setting! Iron, glass and acrylic. Candle not included.